Facebook has received a lot of negative press recently for changing the way business pages are seen in a user’s newsfeed and I have seen lots of grumblings about Facebook ‘being mean’ and ‘forcing people to pay for ads’. Whilst I don’t believe that Facebook is being mean and deliberately forcing small businesses out of business it’s certainly not easy to get noticed as a small business on Facebook any more. To be honest, I have thought more than once, ‘why bother with facebook any more?’ The thing is though, there are over 1.3 billion active monthly facebook users. And I bet most of your friends are on Facebook – I bet more are on Facebook than they are on Twitter, Pinterest or Instagram. My point being – Facebook is where the public is! Just in case you haven’t heard of the 80/20 rule – 80% of your posts should be useful, entertaining, helpful posts (relevant to your niche) and 20% can be sales related. You don’t have to sell at all from Facebook, you could use your 20% ‘sales’ post to direct likers to your website, blog or newsletter subscription – wherever you want them to be to convert them to buyers. 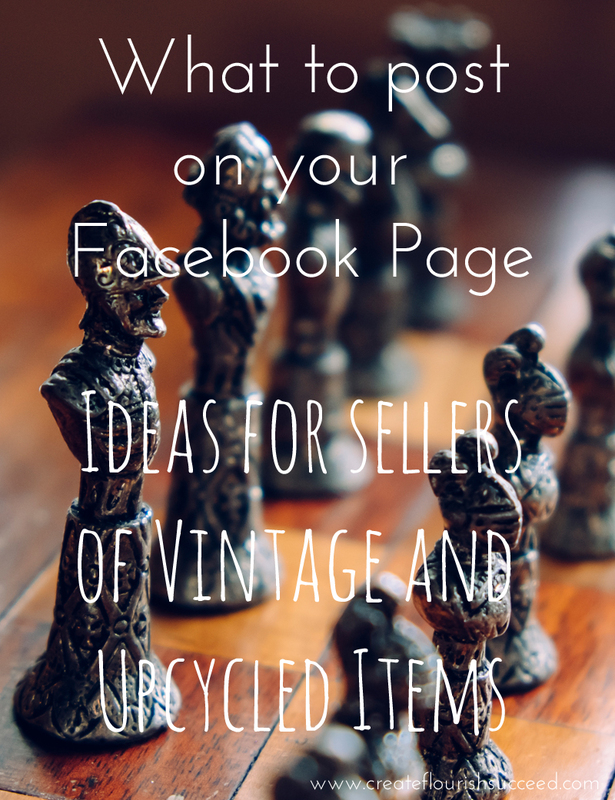 As Vintage and Upcycled sellers, I think you have so much scope for telling interesting stories about your products that catch your liker’s attention. Where did you get an item? What did you have to do to it to make it sellable? What is its history? What was it used for? Is it used for something different today? You could share a tutorial on what works best to clean antique jewellery, share some gruesome facts on the time period a piece of furniture was made. People like to share helpful posts. And things that make them go eurrgh! People are more likely to stop and look at a photo or video and video is a great tool for getting people to remember you. So get someone to film you doing a short ‘how to’. Or film someone else doing it if talking on camera is too scary (it is for me!!) When taking photos make sure you take good photographs of your products. Take them in natural light, make sure they’re in focus. You could show a photo of the product in use or a close up of the detail. When you are doing your sales posts don’t just tell your likers what it is you’re selling or what it does. Tell them how it will improve their lives or solve a problem they have. That the gorgeous vintage necklace you’re selling is the perfect gift for great aunt Mildred. That the little upcycled table will fit in that weird little space behind the door in the hallway. Use language that makes them imagine them using your products. When you are sharing your sales posts, make sure you add clear descriptions and prices to them, including on any photographs you upload. Include a ‘call to action’. How do they buy it? Do they PM you? buy from a website? People online are lazy, the more information they have to ask for, the less chance there is of making a sale. I don’t think it’s time to write off Facebook as a marketing tool just yet, just remember quality over quantity. It’s about building personal, lasting relationships with your likers and no longer just about the ‘like counter’. Over to you…. how do you use Facebook? What works for you to engage your customers? Leave me a comment and let me know.